UPDATE [2013-03-14]: It looks like Blogger has updated a lot of things on its Template Editor since the time of this writing so, I've added some updates on the notes that needed updating (??). I've marked them with "UPDATE" or a strikethrough and I hope this won't confuse you (or myself). I've always wanted to create my own Blogger template and tried so many times before but couldn't really get it right. I think I finally understood a somehow large chunk of it. I think. Anyway, here in this post, I will note about the things I have learned/will learn in creating your own template. I won't be getting into much detailed stuff on HTML and CSS how to's. I'm assuming that you already have basic knowledge on these subjects and that you know your way around Blogger. Still, if you have any questions or there is something I didn't explain well, just feel free to leave a comment, and hopefully I can answer it. Also, since I am also just learning about this, please don't expect a fully functional and Template-Designer-compatible template -- especially since I don't really use the Template Designer. However, I will try to make it as flexible as possible. Create a new blog for your test template, if you haven't got one yet and select a Simple template. It's best if everything is in its default state. This way, you can really see the changes you apply in your template. Also you wouldn't want to play around with your live blogs and unintentionally mess it up. Before making any changes, download a copy of the template (Template » Backup/Restore) for reference. For your test blog, in the Layout page, remove all widgets (Archive, Profile, Lists...) except for Blog Posts. If you can't get rid of the Header and Attribution widgets, edit the template (Template » Edit HTML) and search for Header1. On that line of code, change locked='true' to locked='false'. Do the same for the Attribution by searching Attribution1. Once done, go back to the Layout page and try deleting them. Hopefully that should work. UPDATE: Removing the widget in Blogger's HTML editor will also remove the widget from your template layout (unlike before). Yay! Once you remove all possible widgets, create a New Post. You can use default text templates found here at Html Ipsum. These templates already consists of HTML tags you would normally use in a blog post. Having a test post like this will be a big help in designing your template. Also, don't forget to set your test blog's privacy settings - Not listed on Blogger; Not visible to search engines. If you won't be using external apps for further testing, you can also set the permission (Blog readers) to Blog author instead of Anyone. Fig.1 - Stripped the Layout. Now onto the code and stuff. If you are editing your template's xml file in a different editor (like Notepad++) other than Blogger's, be sure to set its encoding to UTF-8 without BOM. Must read: Intro, Section and Widget attributes. This page gives a brief explanation of the Section and Widget parts of the template. Also the attributes of the <b:section> and <b:widget> tags are listed here which we will use later on. Fig.2 - Just a quick summary minus the attributes. So I made some tests and this is the leanest code I can upload to Blogger. This, by the way, is based on the Simple template - well at least the first 15 or so lines. Fig. 3 - Simplest template code. UPDATE: The XML error message now says "There should be one and only one skin in the template, and we found: 0"
... XML error message: Could not find a preferred section to add deleted widgets to. UPDATE: The XML error message now says "We did not find any section in your template. A template must have at least one b:section tag." As seen on the Layout page (Fig.1) and on the preview (Fig.4), the Blog widget will always be set. 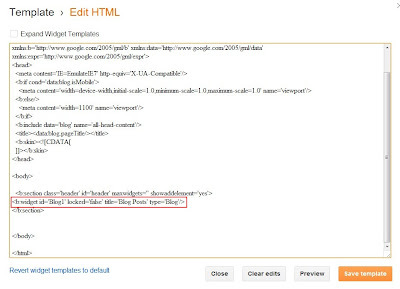 So looking at the HTML code in Blogger (Template » Edit HTML), you will see that a <b:widget id='Blog1' locked='false' title='Blog Posts' type='Blog'/> has been inserted in between the <b:section> tag we created. Note that the id I used for this section is header. This I will change in a bit since I don't think we should leave the Blog widget inside this header section. UPDATE: If you uploaded the template in Fig.3, what you would actually see is an empty page because the Blog widget will no longer be automatically created. You have to add this yourself for you to view any post on the page. Fig.5 - A Blog widget is automatically created in our template. Make sure to include the Blog widget so that you can view your blog posts. This is no longer automatically created. Fig.6 - Added a new section for the Blog widget. Fig.7 - New Layout after adding a new section. Now that we have an Add a Gadget option for the header section in the Layout page, let's add a Page Header widget. Then on the Edit HTML part of the Template page, you will see the Page Header widget right below the <b:section id='header' ...> tag. Note: Just leave the Expand Widgets Templates unchecked. We won't be needing this just yet. As a precaution to prevent deleting the Header when someday we are drowsily updating our blog template, set the header's locked attribute to true. By now, you can probably see the pattern of Blogger's template code. We create sections in the template and specify its attributes. Then on the Layout page, we can add widgets (using Add a Gadget) to the section we have created. Note that we don't necessarily have to use Add a Gadget to add a widget to our template. You can do this manually by coding it in your template. Deleting widgets, however, can't be removed by deleting it from the template code. You need to remove it via the Layout page itself (Edit » Remove). If the Remove option isn't visible on the Edit widget window, check that the widget's locked attribute is set to falseAs mentioned earlier, deleting widgets can also be done now in Blogger's HTML template editor. Let's now move on to defining the rest of the Sections of our template. Normally, it should have a Header, Navbar, Content, Sidebar and Footer. We already have our Header and Content (main) so let me just add the missing ones. Checking the Simple template, I noticed that there wasn't a <b:section> tag made for the Sidebar. Instead, a <macro tag enclosed in a <div> tag was used. Near the end of the template code, there is a <macro:includable> tag. I'm guessing these tags automate the layout for the sidebar's columns -- it generates a table based on the number of columns specified (which can be modified in the Template Designer) for the sidebar. Fig.8 - Simple Template code snippets. Sidebar and Footer macro tags. Enlarge image. For now, I won't be going into the macro stuff since I am just starting to experiment with the blog's layout. If I manage to study it, I may perhaps write a separate blog post on it. To keep things simple, the layout for both the sidebar and footer will only be a single column. Fig.9 - Template code with added sections and widgets. Fig.10 - Layout page with added sections and widgets. Using an invalid id for the widget (e.g. Pagelist1 instead of PageList1) will generate an error. I can't find a complete list of widget types so that I end up using Add a Gadget to install a widget (e.g. 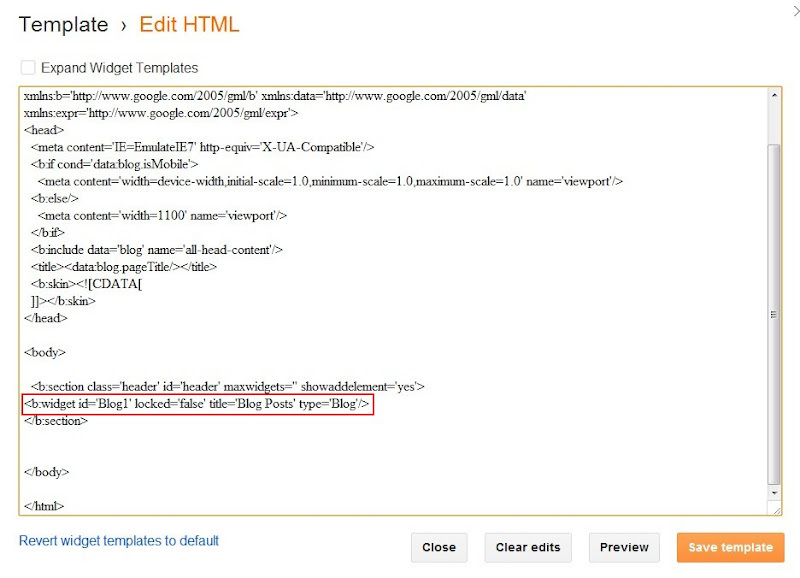 PageList, CutomSearch...) then edit its attributes on the template file. If anyone knows where to find one, I'd appreciate a holler.. I tried removing the title attribute from the PageList in the code but it still remained in the Layout until I removed it via the Gadget's settings. If you are to use you a fluid layout for your blog instead of Blogger's mobile version, I suggest removing the entire <b:if cond='data:blog.isMobile'> block within the <head> tag and replacing it with <meta content='width=device-width,initial-scale=1.0' name='viewport'/> instead. I think I finally got the Section and Widget basics covered. All you would need now is to style your template and fix the layout using CSS and I guess you would be good to go. For customizing certain areas on your template, I'll be writing separate blog posts for it. But if you want to jump right into customizing your widgets, here is another must-read. So if you have any questions, don't hesitate to leave a comment and let's see if we can figure it out. Cheers! it's helpful information and a good starter point for who want to dive!!! Thank you for this wonderful post! It helps me understand their new coding. I've been wanting to make blogger templates, but since they've change it, I got myself a little confused on everything. I'm only good on making Wordpress Themes, haha! Thanks for the post !!! Great tutorial. will create a new template soon !! I’m new to Blogger and I’m helping a friend customize a new Blog for her team. I got them started but I want to dive in to creating something from scratch. 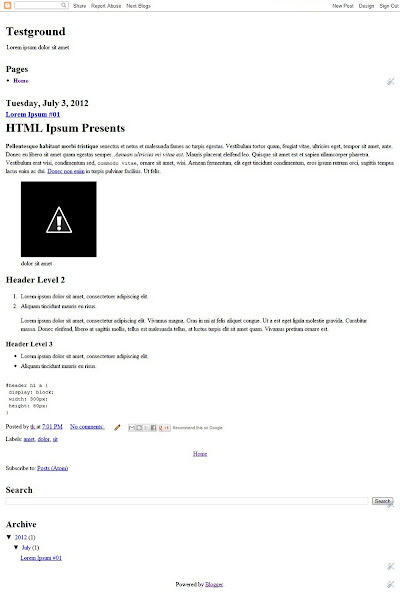 I’m not an expert web designer by any means so this post will definitely help me get started on that project. Thank you. Great post!! Searched google over and over. This post is perfect to start makin a blogger template. im not able to delete all widgets :/ the header and the attribution i do what you said and then i remove them in layout and then when i click save it says error and makes me refresh and its back. same with deleting the whole widget in html. These instructions worked so far, but I noticed that none of my blog titles or hyperlinks work. The ONLY hyperlink that works is the one at the bottom "powered by Blogger"
The "edit" button on the gadgets works, but the "quick edit" button on the blog post doesn't work, as do none of the other things that should be active hyperlinks. Anyone want html and css tutorials can visit. Its a very hard to create blogger template of high class design I suggest to download ready Blogger Template from Internet. This post was really helpful. Also love the way you explain. Thank you. This might be a dumb question, but can you please go over how to edit CSS on Blogger? I am not sure if that's an option since ther's only "HTML editor" available. Thank you very much! I am new to coding and so is trying to design my own template. Thank you again! how to create Landing Page from scratch in blogger? I'd like to thank You for this article - it helped Me a lot in the beginning of learning how to construct Blogger templates from scratch. Especially helpful was that You've obtained as leanest code as possible using back engineering. This saved much effort - and only Your article has that attitude. Today I have much more freedom in terms of how much I am able to achieve in the design. Thank You very much! Thanks for showing me a new technique.I loved it.